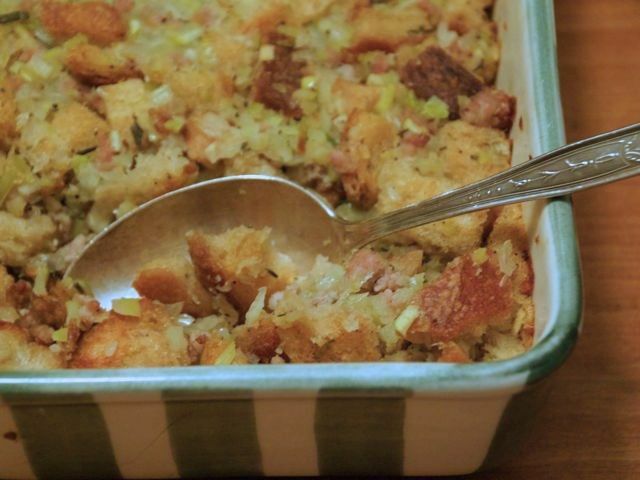 This has become my favorite dish on the Thanksgiving table, and I'm not the only one who loves it. Stuffing suggests that you actually stuff it into the turkey, which you can do, although I usually cook it on the side in a large gratin dish. I always buy the bread cubes at a nearby artisanal bakery, usually combining a mixture of white and whole-wheat bread. In a large skillet over medium-high heat, sauté the sausage, breaking it up with a spoon while it cooks. Once the sausage is cooked through, which takes about 10 minutes, remove from the pan with a slotted spoon and set aside in a large bowl. Add butter and olive oil to the skillet; once the butter has melted, add the onions and celery. Saute until the onions are tender, about 15 minutes. Add apples and cook until tender, about 10 minutes, but still keep their shape. Add sage, thyme, and allspice, and stir to combine. Remove skillet from heat and empty contents into the bowl with the sausage. Add stuffing mix and enough broth or water to moisten the bread but not make it soggy. Season to taste with salt and pepper. Butter one large 9-by-13-inch glass or ceramic baking dish (or two smaller dishes: one to take to the gathering, the other to keep at home). Fill dish with stuffing, cover with foil and bake for about 40 minutes, until heated through and golden on the top; remove foil for the last 15 minutes of cooking.